Crinum lineare is a beautiful lily, capable of producing its outstanding flowers abundantly and will give any home or garden an attractive and stylish look! A bulbous, summer-growing plant, with seasonal shedding of leaves. The bulb is 70–140 mm long and 60–90 mm wide, with a neck; it is covered with layers of dark brown, hardened tunics. Its bright green, deeply channeled leaves form a rosette and appear at the same time as the flowers. Leaves are 9–12, about 650 mm long or longer, 5–25 mm broad, canaliculate, with parallel edges. A cluster (umbel) of 4–8 flowers, grows at the tip of the flower stalk, 180–600 mm tall, subtended by large, transparent, light brownish pink bracts. Flowers are large, funnel-shaped with the upper third recurved, up to 100 mm long, have only one plane of symmetry (zygomorphic), are white, flushed with pale pink, with prominent deep pink median keels, wavy tips, drooping when in full flower, and sweet-scented at night. The fruits are rounded and strongly beaked capsules, containing 1 to 3, very large seeds. This species has a summer growth cycle; producing leaves in late spring and early summer and flowers in mid to late summer (January to February). 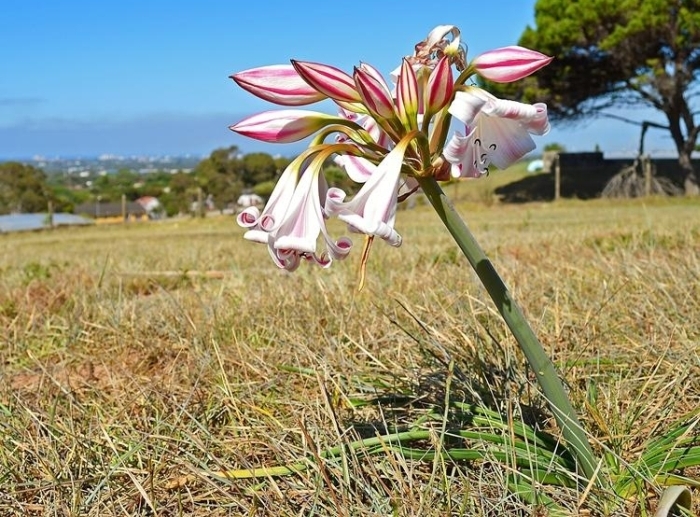 Crinum lineare is assessed as Vulnerable (VU) according to the Red List of South African plants, because of a significant amount of habitat loss, resulting in small and severely fragmented subpopulations, owing to agricultural expansion and housing development in the vicinity of Port Elizabeth. Ongoing habitat degradation takes place as many subpopulations exist on road verges and those on natural veld are being overgrazed. This species is confined to the coastal regions of the Eastern Cape, between Port Elizabeth and Peddie, where it grows on deep sandy flats and on the northern slopes of coastal hills, in open grassland, few kilometers from the sea. It is notably one of the few species with narrow distribution. Although its populations fall within the winter-rainfall region of the Eastern Cape, the species has adopted a summer-rainfall growth cycle, undergoing complete dormancy in winter. 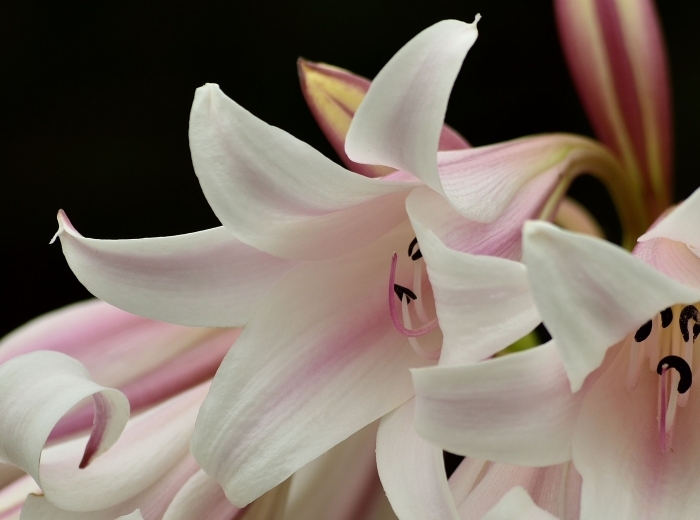 The name Crinum originates from the Greek krinon, which means ‘white lily’. As most species have white or whitish flowers. The specific epithet lineare, is descriptive of its long and linear leaves. The history of this species dates from 1773, when a Swedish botanist by the name of Carl Peter Thunberg found and collected it between Van Stadens and Swartkops Rivers, near Port Elizabeth. A specimen to which its name is attached, was sent to the Uppsala Herbarium and formally described by Linnaeus Younger in 1781. There are between 60 and 100 species of Crinum worldwide, occurring in America, Africa, and southern Asia to Australia. 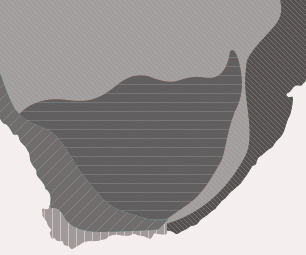 Africa has the most species, with 21 recognized in southern Africa. The genus is related to a group of mostly southern African endemic genera, constituting the tribe Amaryllideae (Meerow & Snijman 1998). Crinum lineare is closely allied to C. lugardiae, but distinguished by its rosette of bright green, smooth, spreading and deeply channeled leaves, with toothed margins. The latter species is generally recognized by its narrowly strap-shaped leaves, having hairs and wavy margins and found in the Northern Cape, North-West, Gauteng and Limpopo parts of southern Africa. Crinum lineare is found in small colonies or singly and as mentioned on its conservation status, its populations are now small and fragmented. Its white, funnel-shaped, night-scented flowers indicate that it is probably pollinated by a moth. Information on medicinal and or cultural uses of this species is not documented on sources consulted, but generally the species of this genus are known to have been used in traditional medicine as a protective charm, or to treat urinary tract diseases. 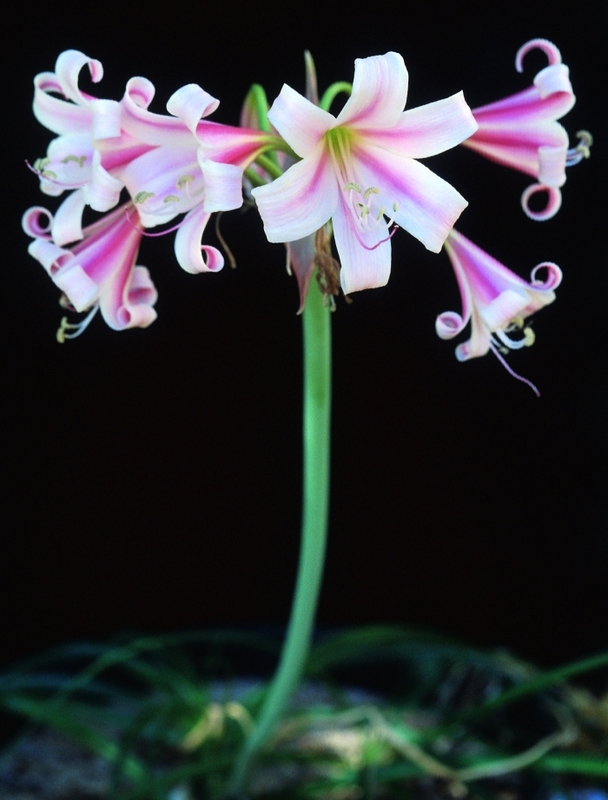 Crinum lineare is a well-known and lovely garden plant! Crinum lineare is easy to grow and flowers profusely in cultivation, and is the best plant for containers, but because it is a large plant, its container must be deep, at least 30–35 cm in diameter (Duncan 2010). It prefers deep, well-drained, sandy soil containing minimal organic matter and requires full sunlight or bright light. Heavy watering every 10 days or 2 week period is recommended and bulbs have to be kept dry during the winter dormant period. Plants can withstand temperatures to 0°C. Sow seed in spring. The seeds germinate on the surface of the soil, sending out a long root-like shoot, which grows downwards, forms a bulb after penetrating the soil and sends up a leafy shoot. 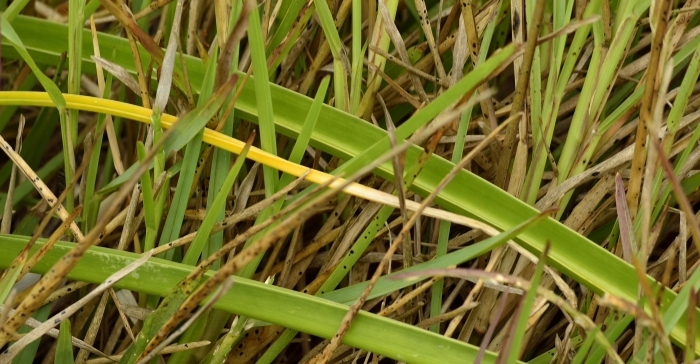 The bulb necks and leaf bases are very susceptible to mealy bug infestation. Dold, A.P., Berrington, W., Snijman, D.A., Raimondo, D. & Victor, J.E. 2007. 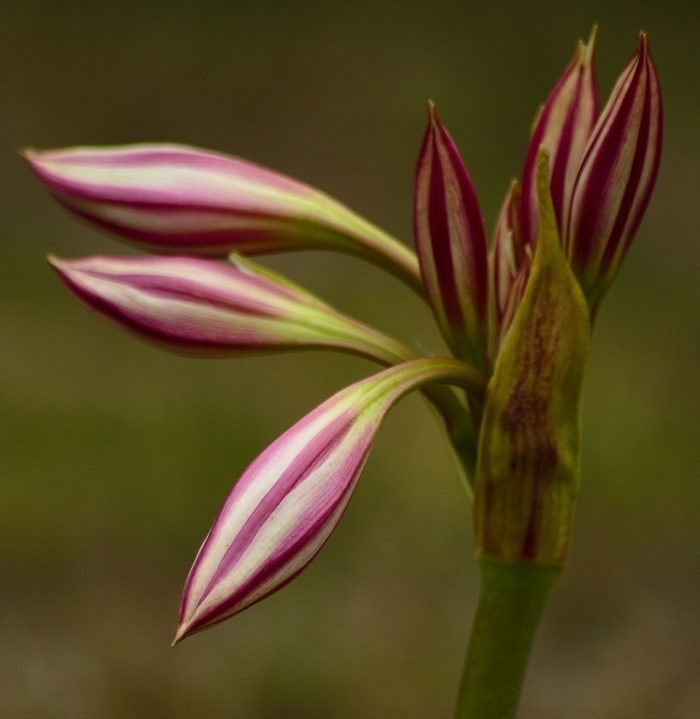 Crinum lineare L.f. National Assessment: Red List of South African plants version 2017.1. Accessed on 2018/11/21. Meerow, A.W. & Snijman, D.A. 1998. Amaryllidaceae. In K.Kubitzki (ed. ), Families and genera of vascular plants, volume 3. Springer-Verlag, Berlin. Verdoorn, I.C. 1973. 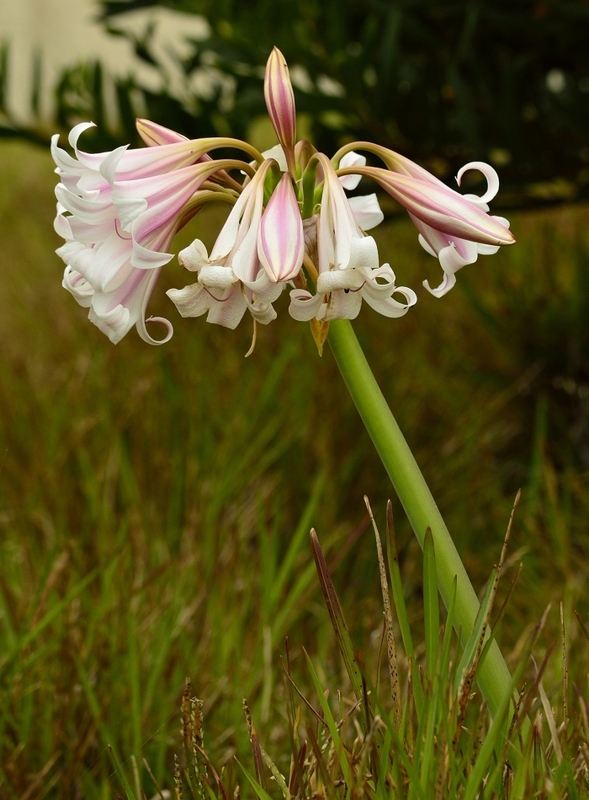 The genus Crinum in southern Africa. Bothalia 11 (1&2): 27–52.